Tollywood Superstar Mahesh Babu Wax Figure unveiled at AMB Cinemas in Hyderabad on Monday. It is the only statue of Madame Tussauds which has ever been brought to India. Following the Mahesh Babu Wax Figure Launch Event, the Mahesh Babu wax statue will be taken back to Madame Tussauds Museum in Singapore where it will then be open for the general public to view. Along with Mahesh Babu, his wife Namrata Shirodkar and children Gautham and Sitara were also present at the unveiling of the Mahesh Babu wax statue. The actor took the opportunity to interact with fans who were present. It has been reported that some fans will have the chance to take a selfie with the statue of the actor before it is flown back to Singapore. 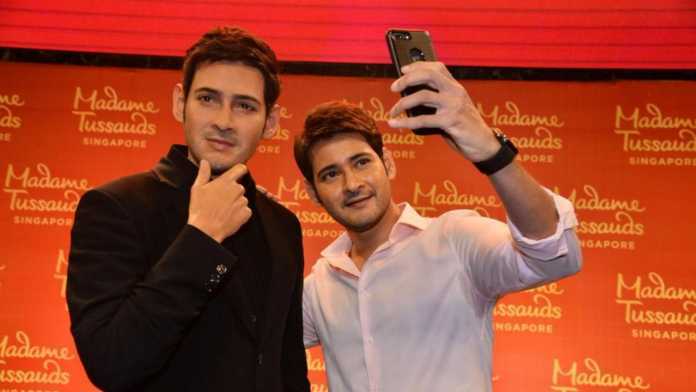 Actor Mahesh Babu wax statue will be available for public viewing at AMB Cinemas for a day before it is taken back to Singapore and installed at the Madame Tussauds museum. Mahesh Babu will be joining a list of several top Bollywood stars who have been featured at Madame Tussauds. Among the celebrities who are featured are Amitabh Bachchan, Aishwariya Rai Bachchan, Shahrukh Khan, Salman Khan, Hrithik Roshan, and Madhuri Dixit.